Not far from where Camilla lives in Edinburgh, there is an interesting area called Quartermile. I say interesting, but I mean that in the same sense as a traffic accident or something like that. Originally, the site was home to the Royal Infirmary of Edinburgh, which according to wikipedia was a hospital for the poor, which consisted of a lot of nice, old buildings of stone. Or, I suppose they weren't old at the time, but they grew old, and fell into disuse. Recently, however, some clever financial person or other decided that one could probably make a heap of money by converting these nice old buildings into flats. And then it was also realised that one could make even more money by putting up a bunch of modern glass-and-steel type apartment blocks in between the nice old stone buildings. Currently, I think several of the new buildings are more or less done, and a flat there can be yours for the low, low price of £ 250000 for about 42 square meters, while the refurbishment of the old buildings is, as far as I know, not done yet. In addition to creating a lot of flats, someone has decided that it will probably make the area more attractive if one could have everything one need within a short distance. Hence, there are now a couple of cafés (one of which is of course a Starbucks, situated less than 200 meters from the closest preexisting Starbucks) and a Sainsbury's, soon there will be a 24 hour gym, and probably more things I don't know about, but which are vital to the sort of people who need a 24 hour gym and an onsite Starbucks. Yesterday, as I was walking back from the King's Buildings (oh, by the way, I'm in Edinburgh this week), I decided that I would stop at one of the two previously mentioned cafés. Not the Starbucks, of course, but this nice, Swedish café where they sell fantastic cardamom buns and cinnamon buns. As it turned out, one of our Swedish flatmates from our first time in Edinburgh was working there, and she could inform me that all the buns were gone, and recommended that I come in before lunch if I wanted to be certain to find any. When I came home and told Camilla about this, we decided to go back for breakfast today. In order to find the opening hours, I looked up their webpage, www.petersyard.com, where I learnt that these people take their baking seriously, and while they have very ugly urls (somthing I have begun to pay attention to after I started using django), they have very nice products. And indeed, I was not disappointed when we went there this morning. I ordered a breakfast basket (different types of bread, jam and cheese) and a cappucino, and while the cappucino was good, the bread was absolutely fantastic, and with the cheese and jam, it constituted what I would call a proper breakfast. To sum up, if you find yourself in the area, I can very much recommend Peter's Yard. As the picture shows, I had a cardamom bun. It tasted like a little bit of heaven. HI CAMILLA YOU LOOK LIKE YOU. Hello, Tor, thank you for posting about coffee and buns and making me envious. This is me: burning, nay dying, of envy. Tor: Don't they have coffee and buns in India? Tor: Seriously? They developed nuclear weapons, but not coffee and buns? What sort of country is this anyway? Coffee and buns are more of a specialised art than WMD. It's not all that hard to simply explode stuff. Making stuff taste good? That takes shiny brass balls, and a fine palate, and a sensitive soul. Damn it, Tor, now I'm hungry. 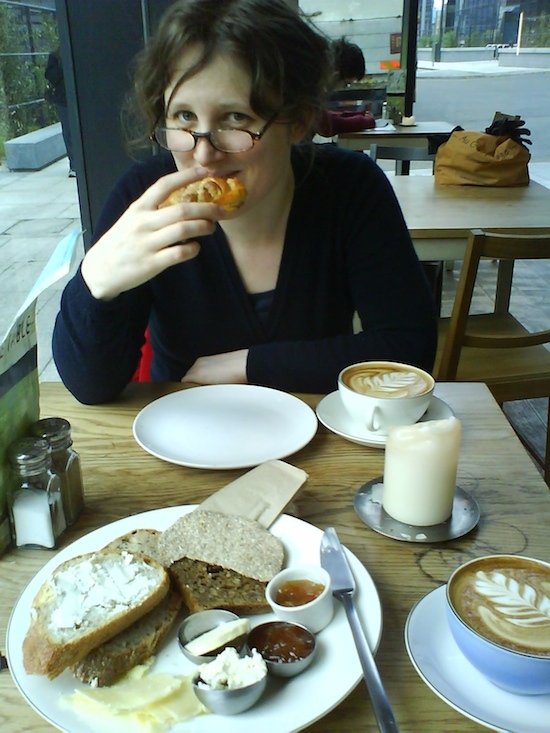 I guess I have to revisit Edinburgh and have breakfast there, simple as that! Another picture with the marvellous sourdough bread. Oh, and Tor.